Looks good. Wish I had one. 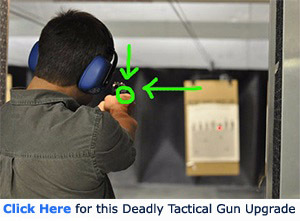 Why dangle that nice looking 9mm in my face and not at least tell me the m.s.r.p.??? That gun has a face only a mother could love. It’s UGLY!!!! It looks like a Glock and a Walther were dropped into a blender and that came out! There is no excuse for bringing an ugly gun to market today! What happened to the gun industry that form rarely follows function? I know . . . I know . . . “an ugly gun that werks and is reliable is better than a perdy gun that don’t werk!” The two do not have to be mutually exclusive! There are a number of guns on the market that attract the eye that are also super reliable! The ONLY ones that will buy this are the followers of the tacti-cool, internet warriors who buy what they are told to buy! I’ll take a 1911 from ANY maker or a Walther, a Ruger SR Series, Beretta, or Sig Sauer ANY day of the week!